Take care of these things before talking to an agent, and you might save some money. Your mortgage lender may require you to have homeowners insurance if you've taken out a mortgage, but overpaying for your home insurance isn't compulsory. The best (and most obvious) way to save on your home insurance is to shop around with different insurance companies so that you'll have a general idea of how much your policy should cost. Keep in mind when getting price quotes that packages differ slightly which may contribute to the price difference. Try to compare similar home insurance policies so that you'll get a legitimate sense of each company's pricing. When you're done price-shopping, here are 10 more ways that you can negotiate a better price. Make sure your home is secured properly. Oftentimes having a reliable alarm system and a deadbolt lock is grounds for receiving a reduction in your home insurance costs. In fact, having a proper home security system may be able to save from 15-20% off your current premiums. Keep a healthy credit history. You may be surprised to learn that home insurance companies often run a credit report on policy applicants and charge more to those who have a troublesome credit history. Although there are many reasons to keep a strong credit history, one of the best reasons is to ensure that your home insurance costs aren't raised unnecessarily. 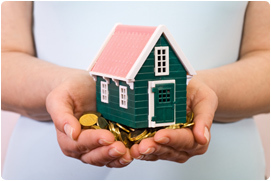 Insure your house for the value of your rebuilding costs, not for the actual cash value (ACV). Many people make the mistake of insuring their home for the value they paid for it, which isn't entirely correct. Since the land itself will probably not be damaged by an unforeseen disaster, you need only to cover yourself for the value of rebuilding your home ? ?“ without the added expense of paying for the value of the land. Don't make assumptions. Many home insurance shoppers are quick to assume that government-sponsored policies are the best or that their "trusted' insurance broker will surely be offering the best deal. Instead of taking these assumptions at face value, do your research and make sure that these plans are truly the most cost-efficient. Look for a senior-citizens discount. Although 55 doesn't seem quite that old these days, it's still sufficient to be eligible for a senior-citizens discount on your home insurance policy. You've earned that discount, why not cash in on it? Take advantage of your home's natural positioning. If you're located close to the local fire station (or even better, if your home is located near a fire hydrant) you can request a discount on your premiums. Avoid frivolous claims. Many people opt to make an insurance claim when it may not be completely worthwhile because they want to take advantage of their homeowners insurance. In reality, however, making unnecessary claims will result in the raising of your premiums which will require you to pay more in the long run.